De'Vante Bausby in 2017 with the Chiefs. Credit: Jay Biggerstaff, USA TODAY Sports. The Denver Broncos needed a cornerback, or two, this offseason and now it seems they’ve added a total of three to their arsenal. According to Benjamin Allbright, the Broncos have signed De’Vante Bausby, formerly of the Chicago Bears and most recently of the Alliance of American Football. Bausby is 6’2″ and 190 pounds and led the AAF with four interceptions on the season before the new league suspended all activities. His 11 passes defended were the most in the AAF, too, as he seems like the best cornerback to come from the soon-to-be-defunct league. 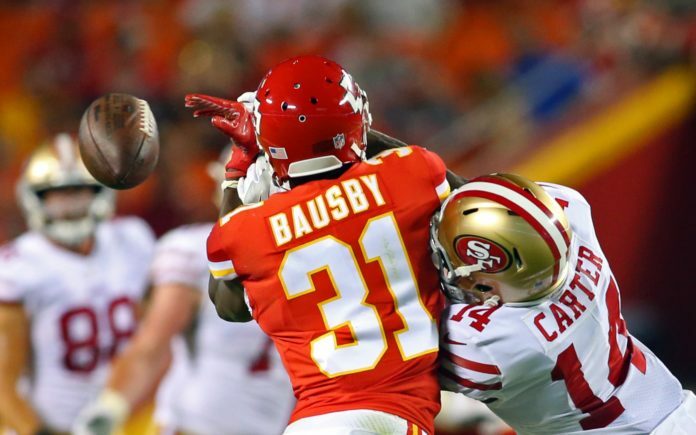 Bausby went to Division II Pittsburg State for college and was originally signed by the Kansas City Chiefs in 2015, running a 4.42 40-yard dash with the wind at his back. In late 2015, the Chicago Bears signed him, and they cut and signed him a total of 14 times, playing in four games in 2016 before the Chiefs re-signed and cut him in 2017. Then, he made his way to the Philadelphia Eagles, finally seeing more playing time last year, with six games played in Philly. He racked up 14 tackles before again being cut and making his way to the AAF. There, Bausby flourished. He picked off his fifth pass, as seen in the second tweet below, which turned into a 99-yard pick-2 as it came on a 2-point conversion. Denver went into the offseason with Chris Harris and Bradley Roby on the roster, cutting ties with Roby by letting him walk. They then signed Kareem Jackson — an unknown star — to play opposite of Harris and followed that signing up with the deal with Bryce Callahan to play the slot. Those moves gave the Broncos arguably the best trio of cornerbacks in the NFL, with three rated in the top-13 in 2018 according to Pro Football Focus. Then, they added even more depth with the addition of Bausby on Thursday evening. Denver’s biggest weakness — cornerback — has now likely become their biggest strength among any position on the team. What it means with the upcoming NFL Draft approaching is the Broncos are extremely unlikely to take a cornerback in the first round as they’d been rumored to possibly be doing for months. In fact, they might not take a corner at all this year considering they’re now stacked at the position. 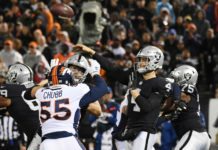 There are still areas of need to address, like at inside linebacker, tight end, receiver and interior offensive line, but John Elway and the front office have quickly revamped that defensive backfield. As Von Miller said on Tuesday, the pass rush and DBs go hand-in-hand when it comes to pressuring quarterbacks and forcing them into mistakes and even turnovers. Denver’s quietly — and sometimes loudly with the signings of Jackson and Callahan — positioned themselves this offseason to make a push for the playoffs in 2019.